A photo of a miniature footbridge of 10 feet across a narrow road had been circulating online and had been sparking various opinions from the netizens. 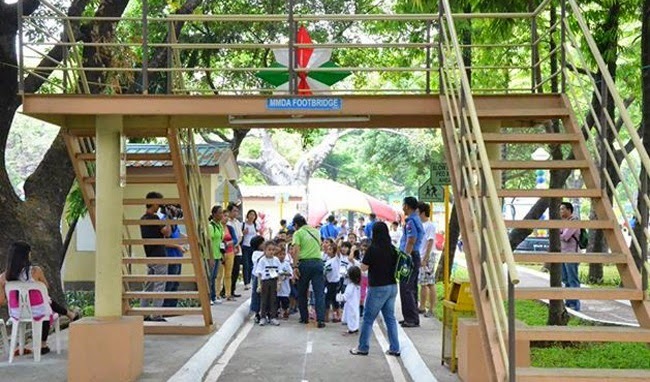 According to MMDA, as posted in their official Facebook account, the seemingly useless structure for some people is actually part of their program in teaching children about road safety. In the photos posted by MMDA, an MMDA officer is guiding a group of children while climbing down the footbridge. Some photos show the kids touring the ‘Children’ Road Safety Park’ and being taught about road signs and safety. As stated with the album that had been posted 6 months ago, Philippines is having serious problems with children being involved with traffic injuries. The MMDA had based their park with Singapore’s safety park. The children’s park has 4,600sq meters that shows miniature sidewalks, bicycle lanes, side walks with drainage system, and traffic structures. It even has infrastructures that builds a community like hospital, school and more. The park is planned to make kids aware about the road safety and the reasons why road constructions are made. It also aims to teach dangers of the road and the importance of regulations. They even included the positive effect of biking in the environment. The park is located in Quirino Avenue just at the front of the Manila Zoo. Despite the good intention behind the program, some had misinterpreted the photos posted by some netizens in Instagram. Others was mislead by a thought that the structures are pointless and a waste of tax money. MMDA posted on Twitter that the photo is actually part of their project. The park had actually been opened on November 2012 lead by former Manila Mayor, Alfredo Lim. According to Atty. Ynes Gonzales the photo was indeed misleading without the actual facts.